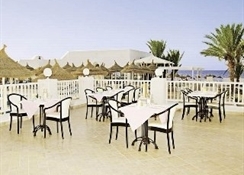 The Club Calimera Yati Beach rests in a prime position directly at the beach about 5 km from the town of Midoun in exotic Tunisia. Fully air conditioned and set steps from the sand and water, this superb Moorish style 3 Star hotel offers traditional Tunisian hospitality, fabulous food, a host of relaxing facilities including a water sports station and wellness centre, and 326 rooms all boasting modern amenities. Guests to the Club Calimera Yati Beach can relax on marvellous beaches and explore countless attractions such or just stay put and enjoy the huge range of facilities available. Getting to the Hotel: The Hotel is 20 km from the capital Houmt Souk and 30 km from the airport. Local Tips: A variety of the area's places of interests such as the Guellala Museum, Borj El Kebir, the Casino, and Royal Carriage Club are within easy reach from this hotel. Dining: The hotel is booked as Ultra All Inclusive accommodation with breakfast, lunch, and dinner buffet with show cooking. A late-riser Continental breakfast is from 10 to 11 am. Club Calimera Yati Beach is proud to present its non-smoking restaurant with baby corner, Café Maure, pool and snack bar, indoor bar, 2 A la carte Restaurant (Italian & Tunesian) and disco. There are themed buffets several times a week, midnight snacks, coffee/tea and cake/pastries, and local alcoholic drinks and soft drinks 24 hours. Gentlemen are required to wear long pants at dinner. Activities: Pool, quiet pool with bar, each with a separate children's basin, wellness area with indoor pool, sauna, Jacuzzi, and massage, full activities program, 4 tennis hard courts, playground, indoor/outdoor theatre, bar/disco, workshop/atelier, beach towels: available for a deposit, sun umbrellas/sun beds: included at the pool and on the beach. Archery, Bocce, darts, backgammon, miniature golf, garden chess, shuffle board, table tennis, water polo. Some activities are with charge. For the Kid's: Affectionate child care in groups divided by age (3–12 years of age), hourly care, 6 days a week in the Calimigo Kids Club, exciting program for teenagers (13–17 years of age) during the holiday season, loan of Schmidt Games free of charge, sanitary facilities suitable for children, generously equipped playground provided with shade, baby corner in the restaurant, baby cot (on request, depending on availability), babysitting service (fee applies, depending on availability). Additional: 24 hour reception, multilingual staff, safe deposit box, hairdresser, shops, boutique, Internet corner/Wi-Fi free (reception & bar), tour bike rental, scooter rental, diving school can be reached at the hotel temporarily from April to November, closed from December until March. 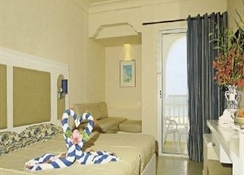 The Club Calimera Yati Beach features 326 rooms including double rooms for up to 3 people, economy rooms, and larger family rooms. 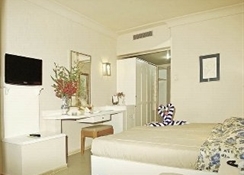 All rooms are equipped with air-conditioning (between 15/6 and 16/9) and heating, safe, telephone, Satellite TV, bathroom facilities (shower or tub, hairdryer), and a balcony or terrace, Safe free in the room. Mini refrigerator available for a fee. The sports possibilities at this aparthotel are especially attractive, with a fine sandy beach known for its excellent watersports and a children's entertainment programme. In addition to a poolside snack bar, sun terrace and sun loungers, guests may avail themselves of the steam room and sauna. Massage and spa treatments are available. Aerobics, jet skiing, diving, surfing and windsurfing are available to the aparthotel's guests, along with motor boating, banana boating, sailing, catamaran boating and pedal boating. Guests may also enjoy tennis, table tennis, darts and beach volleyball as well as minigolf, archery and horse riding. 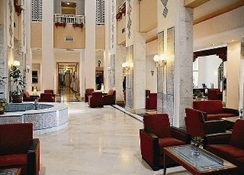 This 336-room aparthotel is a Moorish-style complex with one 2 and one 3-storey building ideal for a family holiday. 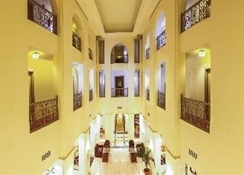 This air-conditioned aparthotel has a lobby with 24-hour reception and check-out service, currency exchange facilities and a hotel safe, as well as lift access and a newspaper stand. The aparthotel also features a café, a bar and a restaurant as well as Internet access, laundry service and a car park.The en suite rooms are furnished with a double bed and feature a bathroom equipped with a shower, a bath and a hairdryer. All guest rooms feature satellite/cable TV, a safe and a fridge as well as air conditioning, central heating and a balcony or terrace.